Pori Urundai is one of my favorite evening snack. This is my first attempt in trying this pori urundai. 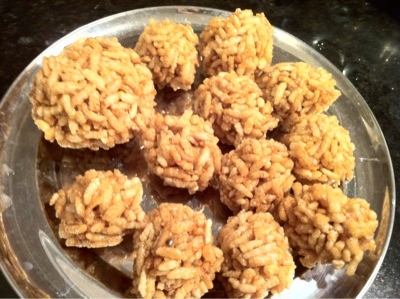 Last year my MIL was here with us and she made pori urundai for karthigai deepam. This year I had no other choice other than trying this on my own. I was little bit scared to try first because my patti used to say that you should be very careful while cooking jaggery. For the first timer, it came out to be a good one. Here goes the recipe. Melt the jaggery adding required amount of water to cover it. Remove the dirt from it by filtering it. Now let it boil in a heavy bottomed pan. Mean time, remove dirt from pori (if any) and keep it aside. Add cardamom to the boiling jaggery and let it boil nicely till it reaches a consistency of rolling ball. Keep a small cup of water near you. when you feel the jaggery is ready, just put a drop of it in the water and try to roll it like a ball. It should stay. It should not be a hard ball. Turn off the stove. Add the ghee and add the pori slowly, stirring continuously. Let the jaggery coat in each and every piece of pori. Grease your hands with ghee/rice flour and make small balls. Store it in a air tight container. Feel like munching some.Love it.